Gift of Joyce Ellen Weinstein. Born in New York City, Joyce Ellen Weinstein received a MFA degree from the City College of New York. She has received many honors and her work is included in numerous museum collections, such as The Foundation Collection of The Twin Cities Museum of Contemporary Art, The Florida Holocaust Museum, and The National Museum of Women in the Arts. 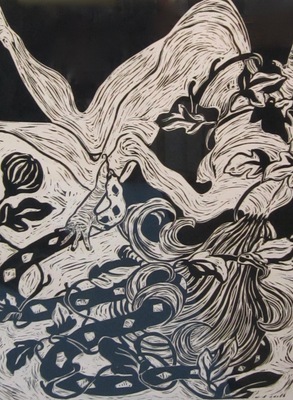 Weinstein’s linocut Eve revises the traditional theme of the Expulsion by representing a writhing figure whose body is extremely contorted in response to her shocked state of being.